Tucked slightly off the road just south of the Waukee Timberline Soccer Complex, you’ll find a spaceship-looking building, better known as the Waukee Innovation & Learning Center (WILC). This sleek and modern facility is part of the Waukee Community School District and is the only one of its kind here in Central Iowa. The WILC opened its doors this past January and is now home to the Aspiring Professional Experience (APEX) program for local high school students. Michelle Hill, director of APEX, says the WILC was purposefully designed to be a welcoming, collaborative environment. “Our philosophy at APEX is for students to take ownership and leadership of innovation, and that’s exactly what’s reflected in the WILC,” said Hill. APEX offers courses in five economic sectors—engineering; human services; finance and insurance; business, technology and communication; and bioscience and value-added agriculture. Within these sectors, there are 11 courses (soon to be 14) for the 2017-2018 school year. Each course has its own “studio” within the WILC. 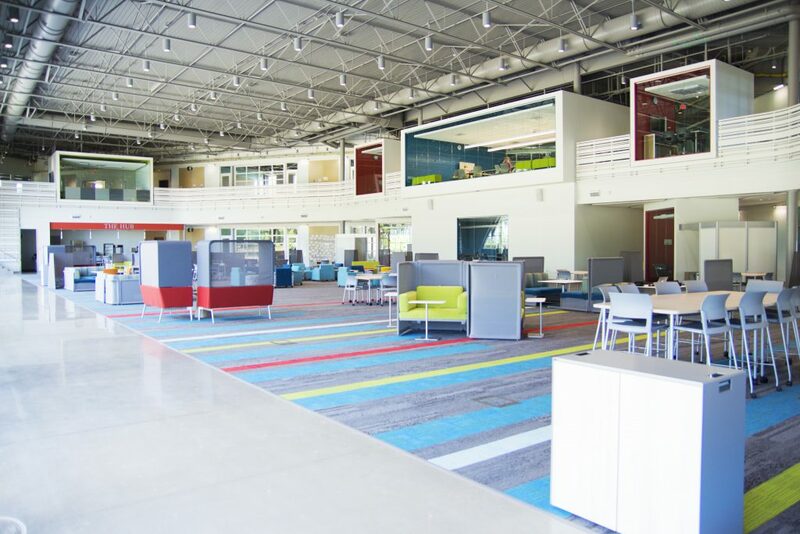 The building also features some open learning spaces, like the “triangle” in the middle of the building, where furniture can easily be moved for small group work or large speaking events. One of the more unique features of the WILC is The Hub Café, which offers fresh food and even has a reclaimed barn wood kitchen table with the APEX logo for its base conceptualized and designed by students. Every aspect of the WILC allows for what Hill and her team call “creative collisions.” As students come to co-work, serendipitous interactions happen, including relationships with business professionals. Russ Goerend, an APEX instructor who previously taught sixth grade English in Waukee, says the WILC structure and the APEX program give metro high school juniors and seniors a rare learning opportunity unlike anything in the traditional classroom. Each APEX course has its own curriculum team made up of academic and business partners. Curriculum is evaluated and refreshed every six months to keep it relevant to the needs of the industry. Hill, Goerend and the APEX instructors also receive support from an advisory board of 23 partners who assist with program strategy and planning while also assessing workforce trends. Before the WILC opened, students met exclusively at the offices of APEX partner businesses—what the program calls “host sites.” Now that students have a permanent space, they have the luxury of equally splitting course time between the WILC and in the professional environment, which Goerend said is essential to the program’s success. 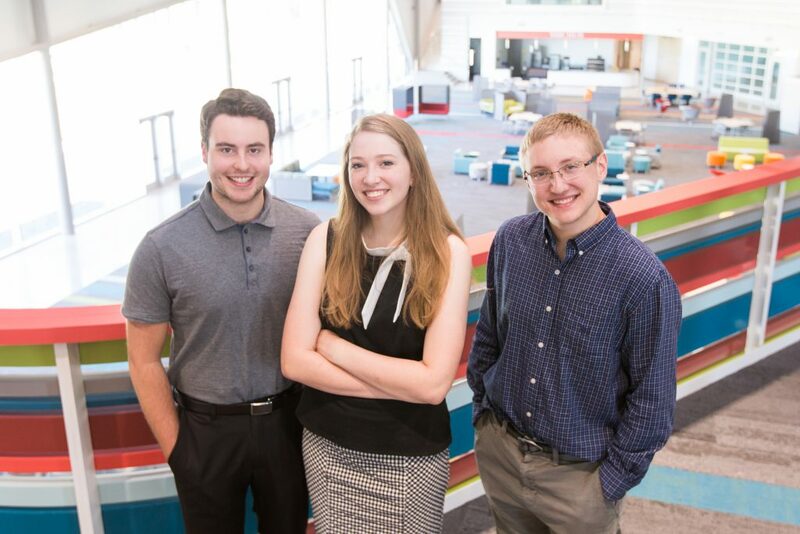 While the school-to-work program functions more like an internship, APEX exposes students to working with real clients on real projects with real feedback, paired with the technical skills for completing the work and delivering the final product. One such partner is the City of Waukee. Goerend teaches a course called Designing Communications Solutions, and as part of this course, he once had his students partner with the City to establish a portfolio of photos from around Waukee. The students were responsible for scheduling, shooting and editing the photos and then delivering the finished photo library to the client. But, prior to receiving their course projects, APEX students go through a two-week onboarding period during which they adjust to professional dress every day and business basics, like firm handshakes and looking others in the eye. One of the foundational tenants of APEX is there are no prerequisite courses or GPA requirements to join the program, nor an application process. Students simply need to register with their counselor, signing up just like any other elective course at the high school. Primarily filled with students from the Waukee Community School District, APEX has seen tremendous growth, doubling and tripling its class size since its inception. Next year, APEX expects to see 400 students and will add an additional instructor. 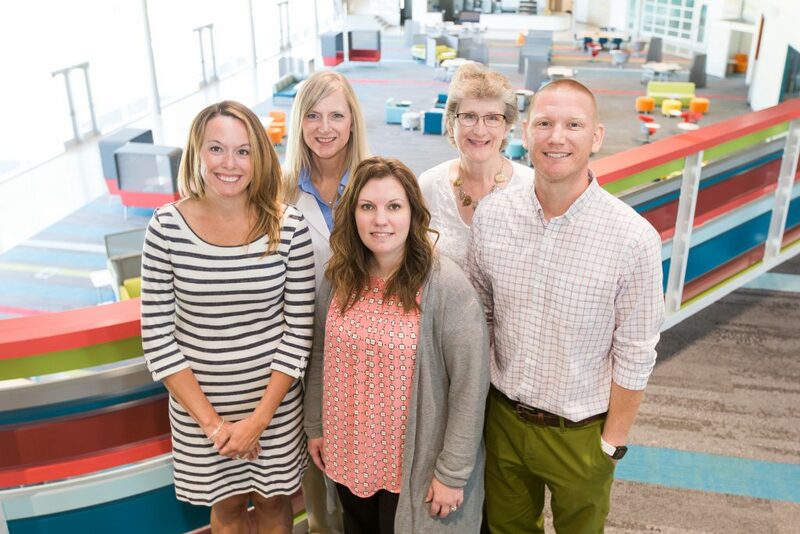 While WILC and APEX offer students a unique learning environment and the chance to explore career possibilities, staff members also hope students begin to see the metro community in a different light—and perhaps consider the Des Moines area when deciding where they want to live and work in the future. For more information on the WILC and APEX, including how to apply or how to become a business partner, visit waukeeapex.org.